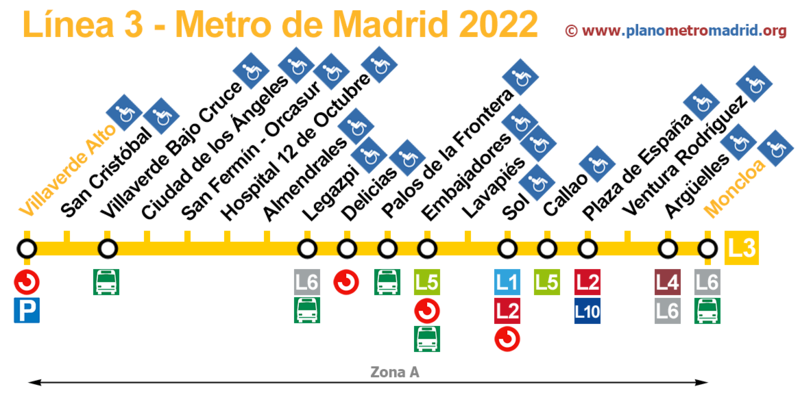 Line 3 of the Madrid metro (L3). updated 2019. Welcome to our web of the map of line 3 of the Madrid metro (L3). Línea 3 del metro Madrid. In the map below are the stations of Line 3, as of January, 2019. This is the list of all metro stations of line 3, which in total has 18 stops. Next to the name of the station, we have added if you can make a transfer to other transport. other information such as transfers to other lines or subway station, bus stops if you have, if they are adapted for people with wheelchairs or prams etc. Clicking on the name of the station, you can check on the official website more information about this metro. If you find a bug or have a suggestion, please contact us. Thank you for visiting, we hope that our map of the subway line 3 of Madrid has been helpful to you.